Earlier in the week Bag Lady, yes…the same Bag Lady from the AT Maryland back pack last fall, put out an all points bulletin for a hiking partner this weekend. She wanted to go face her nemesis from that trip…Lambs Knoll. She also wanted to train for an upcoming hiking trip in Alaska. You just went “wow!” didn’t you? Me too….Alaska …Totally cool! I was in! But turns out she wanted to shuttle so we didn’t have to do an out and back hike. I couldn’t do that as I wanted to bring Sidekick Pauli! So we decided to hike a big loop at Catoctin Mountain Park instead. We met at the visitor center, then started down the trail at about 9:45am. 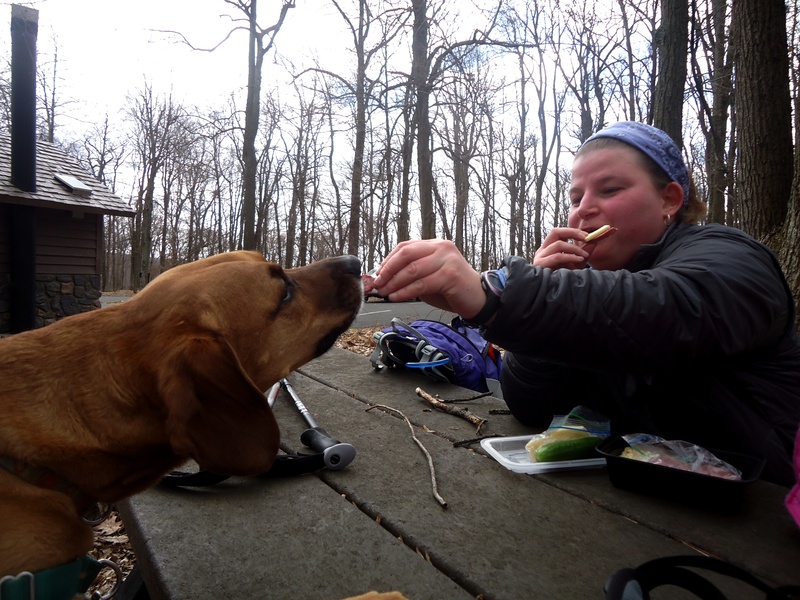 We were hiking an 8.5 mile loop with a stop at Chimney Rocks, the picnic area just before Hog Rock and the falls before trekking back to our cars. The first mile went smoothly and soon we were climbing up the rocky trail to Chimney Rocks. Weather was decent with an occasional chilly breeze that made me happy that I had brought both a hat and my gloves! On the way up we met a guy doing a training hike with a full pack. He was training for Colorado! Wow! Everyone is going to hike someplace really neat this summer!!! I was glad I didn’t have on a full pack! I was already sucking a little wind with a day pack. Up, up, up…reached Chimney Rocks in good time. We took a short break, then continued to Hog Rock. Along the way we passed Wolf Rocks and Thurmont Vista. We did not stop at either. We were ridge walking now and it was nippy! Winds had picked up and it was no longer sunny. As we walked I took in the destruction left by the ice storms. The forest was littered with downed trees and widow makers were left along the trail. I silently mouthed “please don’t fall on me” every time I had to walk under one! We took a nice sit down break at the picnic area before Hog Rock. I ate my PB&J and put out water for Sidekick Pauli. Bag Lady gave Sidekick Paulia slice of real meat (salami? Pepperoni?). Oh good Lord. The look on her face! I am vegetarian…well, not exactly…I eat fish…anyway the point is that she has never had real meat! Sidekick Pauli definitely has a new best friend! We finished lunch and headed across Park Central road to Hog Rock. Supposedly you can see Chimney Rocks from Hog Rock but I have never spotted them and today was no different! I looked a second time searching the opposite ridge…nope, couldn’t find them. Maybe another day! Onward! We crawled down the mountain, visited the falls, then took the rolling path back to the visitor center. There we found out that there is a shelter you can reserve on the other side of the park where the trails are a bit more level. We both thought about a Trail Dames beginner back pack!! Fun! Fun! 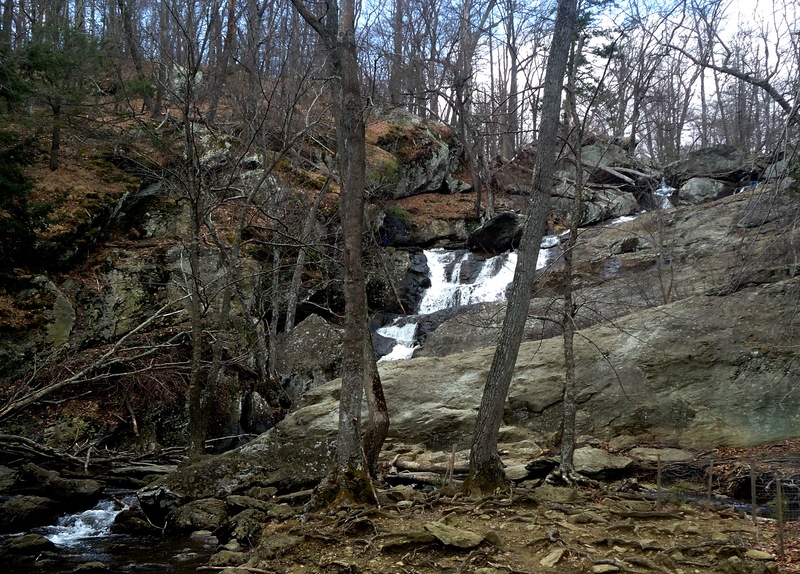 This entry was posted in Off the AT...Exploring other trails! 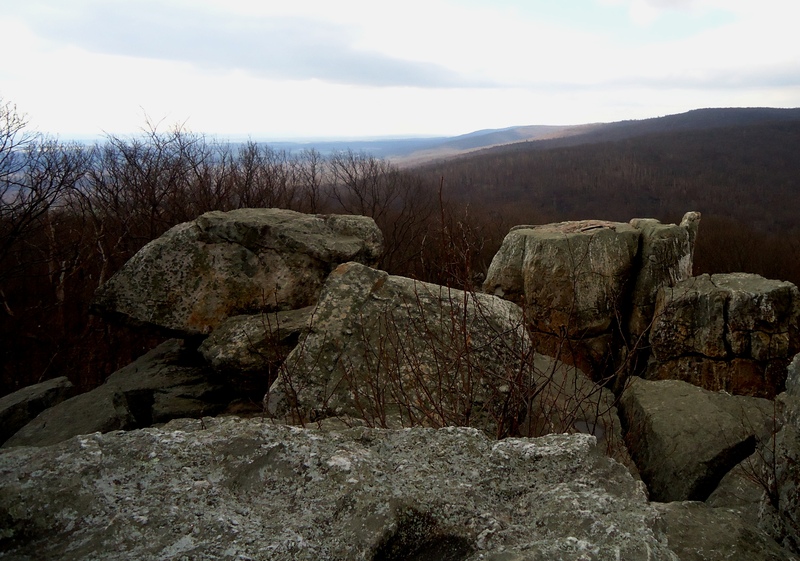 and tagged Catoctin Mountain Park, frederick maryland, Hiking, hiking in maryland, hiking near frederick maryland, hiking with dogs, outdoors maryland, thurmont maryland.